Q: Is it better to hire a Long Distance Mover or an Interstate mover? A: It really all depends on your needs. Long distance movers are generally bigger companies; which means they have more trucks, more manpower and more value added services. They are also authorized to work all over the US, whereas interstate movers are often confined to certain geographical boundaries. If you are moving a lot of equipment across more than three states, then long distance movers are your best bet. However, for shorter moves, it is usually more cost effective to hire interstate movers. Q: What is the difference between a moving company and a relocation company? A: For the most part, there are no real differences between the two. There is one major difference though: relocation companies get involved in the process earlier. Whereas moving companies help you move from one predefined point to another, relocation companies actually help you look for a place to relocate to. Relocation companies have tie ups with realtors across the country, they can actually help you find a suitable office space in your desired city or town. Q: What can we do about items which we don’t want to move to the new location, but don’t want to just get rid of either? A: For stuff which you’d rather not take with you due to space constraints at your new office, but which you really don’t want to simply discard, there are companies called removal companies. Removal companies take care of carting away stuff you don’t need for the time being. They then pack it and store it at reasonable rates. This is best for moves that need to be done in stages. Q: Will the moving company assist in packing? A: Most moving companies do provide that service. Long distance movers in particular can always provide packing materials and packers as well. The method in which they charge does vary though, some charge per item packed, and others charge by amount of material used. Either way, if you aren’t on to tight a budget, it is best to leave the packing to the movers, as they have the right materials and expertise to do a better job than you probably could. Q: If we opt to pack and load ourselves, could we save money? A: For commercial moves, it may actually be a good idea to use your own employees to pack and load. After all, they are on the payroll already and a lot of them aren’t really doing anything else while you are moving. This is of course provided you haven’t already let them go due to the move, or that many of them will move with the company. I guess it all depends on how good a job you think your people are capable of doing. The cost of packing, loading and unloading is not insignificant. Q: What sort of insurance do moving companies provide? A: Moving companies only provide basic liability. That means that your belongings will be covered on a per pound basis. Put another way: should a mover lose or damage an item, you will get a fixed rate for every pound the item weighed in at. 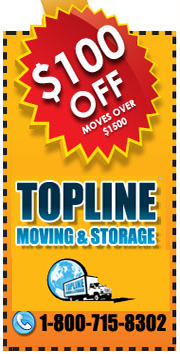 For shorter moves, the rate is about $.30 per pound and for longer moves it is about $.60. Q: Why can’t I get better than basic liability insurance from moving companies? A: Federal Law actually forbids moving companies from selling more comprehensive moving insurance. The primary reason is the huge conflict of interest involved. It would be difficult to trust that an insurance company connected to the moving company would be likely to approve any claims made as a result of damages caused by the moving company. Replacement value insurance is available from third party insurance companies. It provides far more protection than basic liability, particularly for high value electronic equipment. Replacement value insurance awards based on the cost to replace a missing or damaged item, rather than simply on a per pound basis. As an example, an LCD projector bought five years ago is damaged beyond repair, the cost of the projector was $600 five years ago, by now the projector would have depreciated to $350, however, a similar new projector costs $800. You will thus be awarded $800.